The young soldier who was hysterical at the end of Part 2 is conveyed into the shack that Dr. Roney uses as an office. He’s still in shock over the thing he saw inside the aft compartment of the mysterious object they’re digging up. Dr. Roney gives him some brandy from a flask he keeps “for emergencies” and Quatermass questions him about what it was he saw. Roney’s assistant Barbara Judd reads aloud a very similar description of the Hobbs Lane ghost from a 1927 newspaper article. Has the soldier ever heard of it? No. That was more than 30 years ago and he’s not that old. Capt. Potter sends him home. The other men in the Bomb Squad carry on with cleaning the object up. The ejected hatch cover is discovered not far from the opening. Quatermass examines this and concludes that it would have to be unscrewed from the inside to open. But he’s got another intriguing clue to follow up on: the 1927 newspaper articles mention that Hobbs Lane has always had a bad reputation. There were earlier stories of hauntings here, especially in the 1700s. The modern press has been hanging around outside the site, waiting for news and wondering what’s going on since Dr. Roney’s previous openness with them has now been replaced with military secrecy. A photographer from the Gazette has taken a picture of Roney going into the site with Quatermass and Breen; neither he nor his editor knows who these two men are, but a brash reporter with the highly improbable name of Fullalove id’s them and knows now that something really interesting is happening. He grabs a tiny spy camera and loiters at the police barricades in the street, looking for a way to sneak past. Colonel Breen has hired a non-military industrial drill contractor to come in and try to punch a hole through the bulkhead sealing off the forward compartment of that mysterious object–which we might just as well call a spaceship. The drillman brings his own generator to power his strongest drill and sets up lights and equipment both in and outside the hull. Only Breen, Potter, the Bomb Squad sergeant, and Quatermass stay when the drill is engaged. The drill doesn’t break through the bulkhead, but all that power seems to unleash vibrations that pulse through everyone’s heads, causing fainting, nausea, and collapse. Even after the drill has stopped, these unpleasant effects continue. Quatermass leaves to get some fresh air. He finds Dr. Roney and drags him off for some historical research. Fullalove follows them. At some nearby historical archive, we are treated to some lovely woodcuts and 18th-century pamphlets from 1762, reporting tales of strange noises and a sighting of a “hideous goblin” by some men who were digging a well in Hobs Lane. One of the woodcuts features an image of this creature. Quatermass notes the alternate spelling of the street name and recalls that the older version, Hob, was once a nickname name for the Devil. He also reads that even in the 1700s, the place was long notorious for odd happenings. So we go back even further. At the Westminster Abbey archive, there’s an illuminated manuscript with another image of the creature sighted in 1341, in what was then the separate village of Knightsbridge. A helpful clergyman translates the text from the Latin. Charcoal burners chopping down trees in the wood were disturbed by an outbreak of evil happenings, foul noises, and visions of imps and demons. Once again, the area has “long been known as a troubled place.” Apparently, there’s been something wrong there for as long as people have been living around London, and it awakens whenever the ground is disturbed. One of the things I like most about this story–and it’s a theme that’s repeated in The Stone Tape–is that the history of the “bad place” goes back and back into the remote past, to the beginnings of human history and even beyond that. Also, someone in the BBC’s prop department did a nice job of re-creating the pamphlets and medieval manuscript seen so briefly here. Fullalove catches up with Quatermass and Roney at the Abbey and snaps a couple of photos of the manuscript before accompanying them back to the site. At the pit site, Colonel Breen has recovered from the effects of the peculiar vibrations and sees that there is now a small hole in the bulkhead. The drillman says he didn’t do it–the hole is larger than his drill could make. Breen starts poking at the hole with a pencil and eventually breaks through. Air rushes in to the lower-pressure cavity on the other side. Breen then peeks through the hole and sees something that disturbs him, but he won’t let Capt. Potter have a look. When Quatermass returns, he does look and confirms what Breen thinks he’s seeing. “An eye!” Whatever’s inside there, it’s not moving, but both men can smell decomposition and decay. Using the small hole and a big stick as a lever, they turn a circular section of the bulkhead and finally manage to open it up. That vibration fills the air again for a moment. Inside the sealed compartment is a net of filaments and membranes going in all directions and what look like three giant grasshoppers. 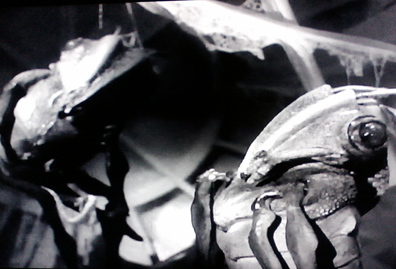 “Demons,” says Quatermass, recalling the medieval manuscript. One falls slightly forward, startling Breen.